Time to Harvest Mesquite Pods! As July approaches, we get excited at VPA because July means it’s time to start harvesting mesquite pods. 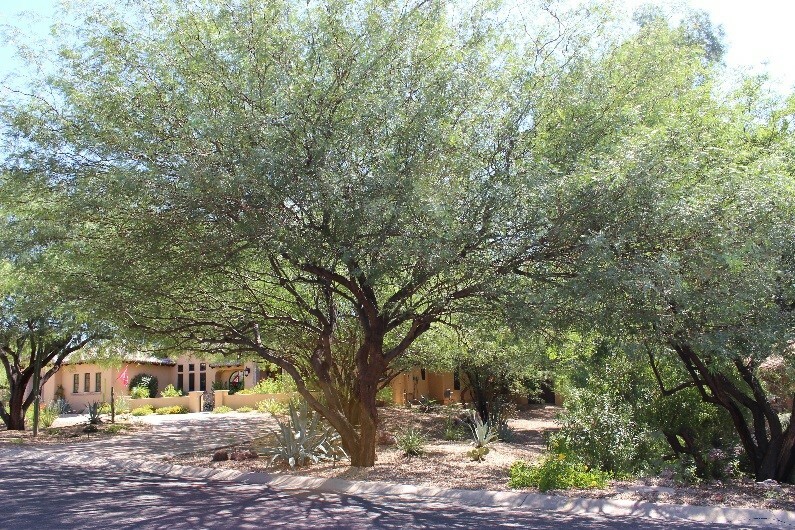 Mesquite trees can be found throughout the valley, such as the one pictured right from a Phoenix neighborhood. This Thursday, July 2 from 7:00-8:30pm VPA will be teaching others how to harvest ripe pods and store them until they are ready to be used. It’ll be a great time to exchange mesquite flour recipes or to just learn about mesquite. For more details or to RSVP click here. 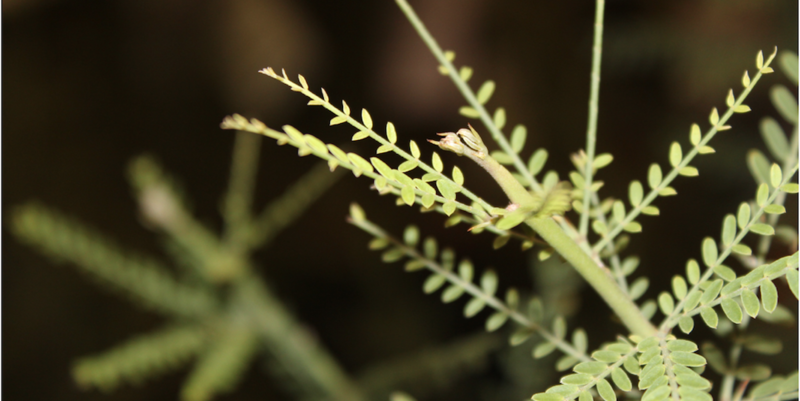 Find a Native Mesquite tree (with thorns) in an area that has not been contaminated by pollutants--good locations are in washes, small drainages, city parks, backyards (with permission of course), and along low-traffic neighborhood streets. Place a sheet or a tarp underneath the tree and gently tap/shake the limbs for the pods to fall. You can also gently pull pods from the tree and collect them in a bucket or bag. The pods should come off easily otherwise they are not ripe, yet. Do not pick-up pods that have already fallen on the ground, as they can be contaminated with mold and animal feces. Also, discard any pods with black mold. To see if a pod is ready, snap it and it should easily break in half. Taste one to see if the pods are sweet and if so, they are ready for harvest. Different species of mesquite trees can have different tasting pods so the general rule is to avoid pods with bitter or chalky tastes or ones that cause a burning in the back of the throat or a drying of the mouth. If the pods need cleaning, mix one tablespoon bleach with five gallons of water in a large bucket. Fill another bucket with clean water. 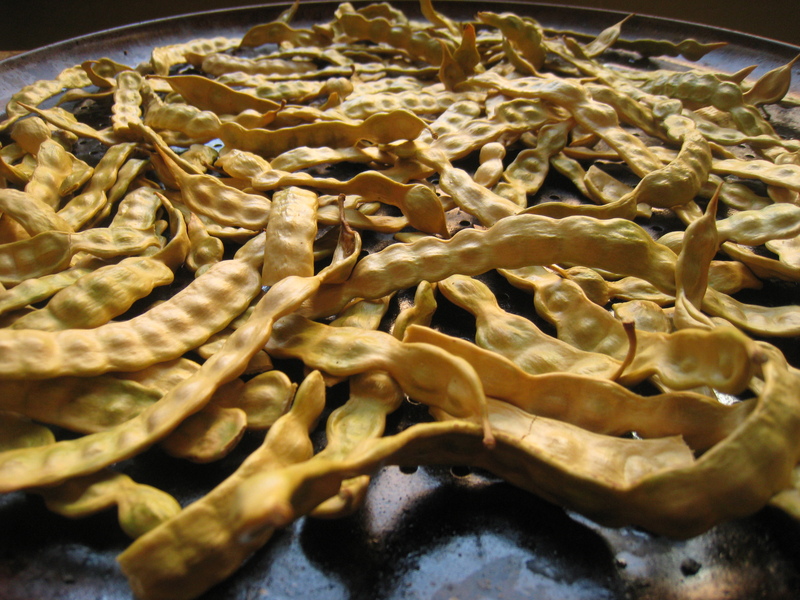 Dunk the pods into the bleach-water and swish them around.Then, swish the pods in the clean just-water bucket and set the pods somewhere to thoroughly dry, preferably on a screen in a shaded area as direct sunlight degrades nutrients and vitamins. Once the collected pods are thoroughly dry, store then in a clean, dry container such as a large Mason jar or cloth bag. To make mesquite flour, first grind the pods in a coffee grinder or high-powered blender such as a Vitamix or Blendtec. Next, using a fine-mesh sieve, filter out any remaining pieces and seeds (pictured below). Now that you’ve made your own mesquite flour, it’s time to cook with it. Not only is mesquite flour gluten-free, it is highly nutritious. Mesquite flour is rich in protein and micronutrients like calcium, iron, potassium, and zinc and it’s gluten-free! It’s also a low-glycemic food because of its high soluble fiber content (which means it digests slowly so it doesn’t rapidly increase blood sugar levels), so it’s a good option for diabetics! Mesquite flour tortillas, pancakes, and roasted nuts are some of the easiest and tastiest ways to start experimenting with this Arizona-native resource. 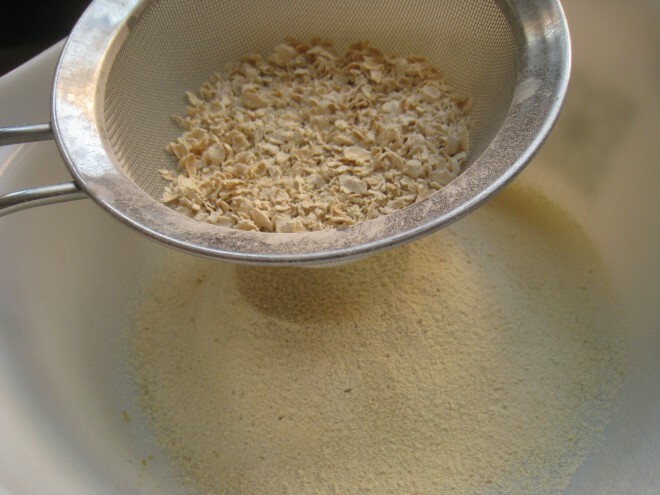 As more people develop a gluten-free diet, you can find many recipes using mesquite flour online. Below is a recipe for mesquite flour tortillas and links to recipes for mesquite flour pancakes and mesquite roasted pecans. Yes, trees get sunburn too. After reaching 105° this weekend, we thought we’d give some tips on how to protect your young (and older) trees from the intense heat. Ever wonder why the trunks of citrus trees are painted white? The reflective paint protects the sensitive bark from the scorching effects of the strong sun. Like citrus trees, desert adapted trees also need protection from the sun, particularly young trees. Signs of sunburn can take a little while to appear so it’s important to monitor your trees. A first sign of sun damage to a desert adapted tree like a Palo Verde is uneven bark color, from yellow to pale green (pictured below). For trees with gray bark, a brown discoloration can occur and later the bark can crack or peel away from the tree (pictured right). While sun is needed to produce food for the plant, too much sun will burn plant tissue on leaf and bark surfaces. Trees with broad leafs, like Mesquites, have tubes which lay underneath the bark and transport energy from the leaves down to the roots. When the bark is sunburned these tubes are often affected and the tree is no longer able to carry food to the roots. To prevent sunburn, it is important to select the proper tree type for the climate. Properly selected desert adapted trees have smaller leaves that release less water and tissues that are better suited for our intense sun. Proper placement of the tree is equally important, as trees planted in west and south facing locations receive the intense late afternoon sunlight. Refrain from planting trees in the heat of the summer or make sure to protect the newly planted trees. Another preventive measure against sunburn is to allow branches that grow along the lower part of the trunk--called watersprouts--to keep growing for at least two years before pruning or removing them. The lower branches not only encourage strong trunk growth, they also shade interior branches and protect the trunk from sunburn. Properly prune your tree to prevent from removing too much of the canopy which exposes tree bark to large amounts of sunlight. Improper irrigation or watering techniques can also lead to leaf loss and further sun exposure. 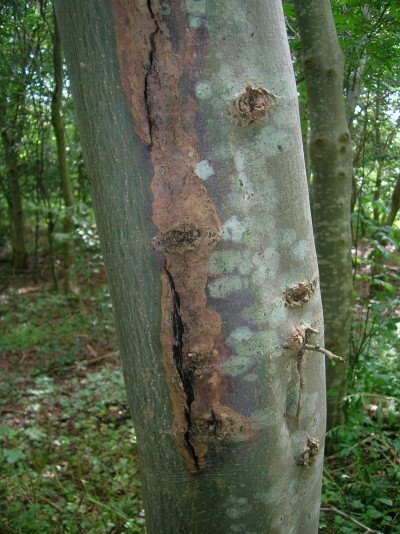 If tree sunburn does occur it is important to address it as untreated sunburn can lead to borer infestation and damage to the tree. To help your trees heal, allow all branches to grow without pruning in order to increase the shade coverage over the exposed bark. Wrap shade cloth or tree wrap around the sunburned area and regularly monitor it. Just as we protect our skin from the intense Arizona sun, take preventative measures with your trees to protect them against sunburn. 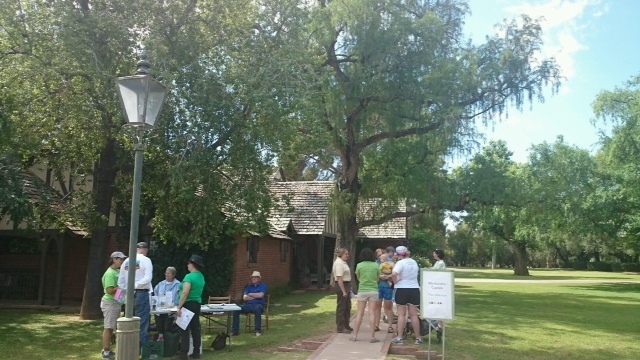 This past Saturday the VPA partnered with Arizona State Forestry, Arizona Community Tree Council, the City of Phoenix, and Arizona Nursery Association to help host the first Tour de Trees event in North Central Phoenix. 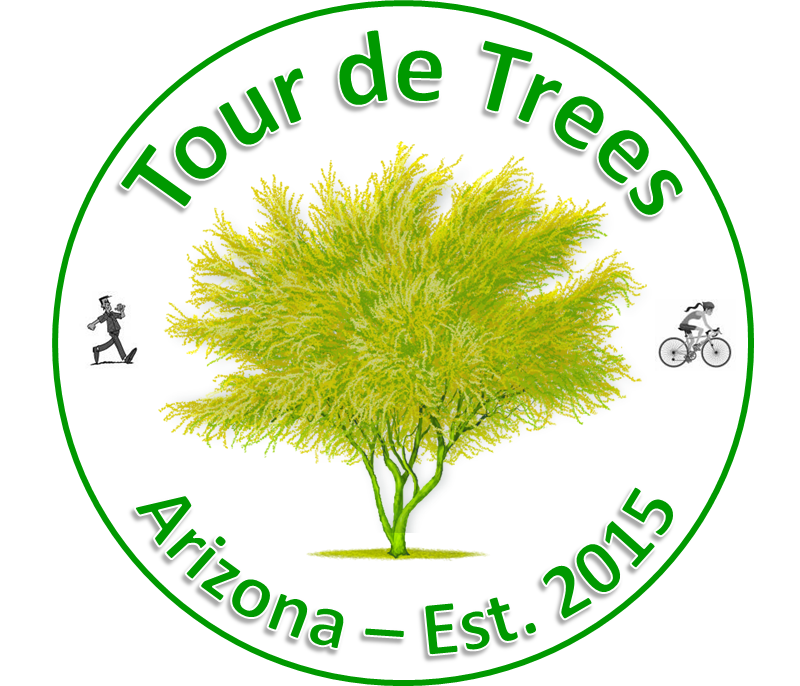 The free self-guided bike, walk, or drive 2.5 mile route showcased 6 beautiful landmark trees throughout the historic and well-shaded neighborhoods along Central Avenue between Glendale and Missouri (refer to the map below or download the route here). The event ran from 8:30-11:30am and began at a Montezuma Cypress planted in the 1960s (pictured below, the tree to the right of the lamppost). 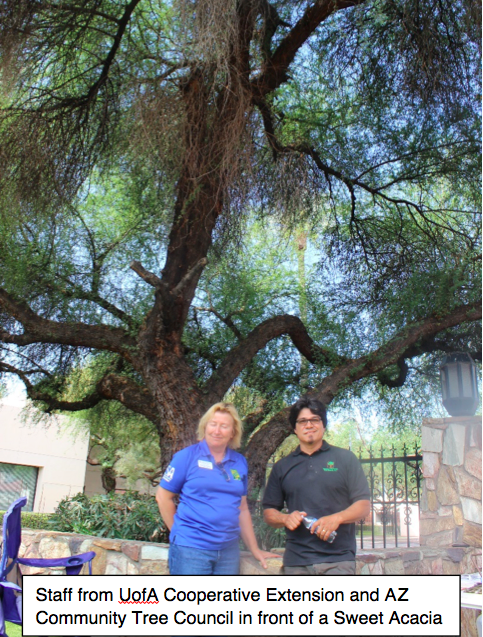 Participants then moved on to the other selected trees, such as a Desert Fern that sprawled over the entire space of the home’s front yard. The route concluded at an amazing Arizona Sycamore that is estimated to be over 90 feet tall (pictured below). 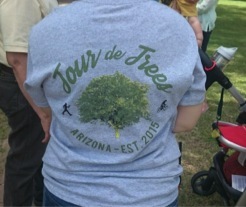 Tour de Trees was a perfect example of what trees do--bring communities together while providing valuable shade on a warm Arizona Saturday morning. Thank you to all the volunteers and tree lovers that showed up! 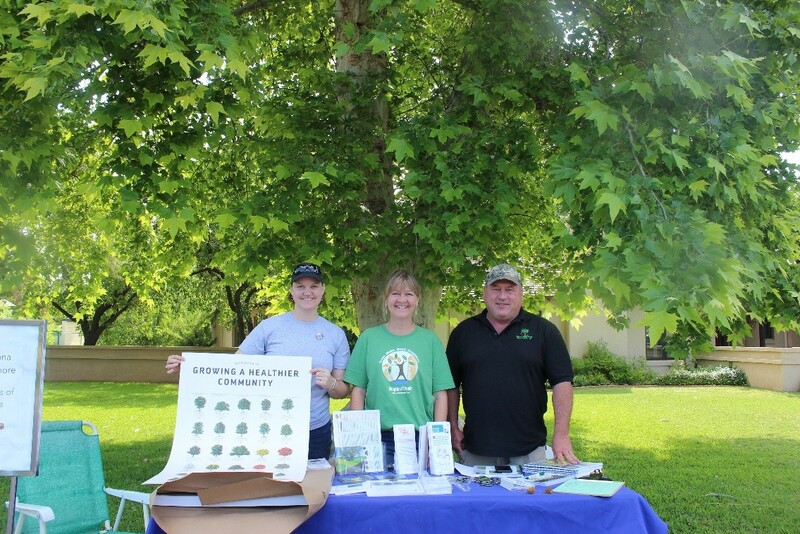 As we prepare for this upcoming Saturday’s Tour de Trees community event, it’s fitting that we end our Why Tree Matter series with a discussion of how trees help develop community. As more people worldwide live in cities, trees improve the quality of life within a community by reducing the chronic stress linked to urban living by providing access to nature and green spaces. Green spaces are areas with trees, plants, and other vegetation. One UK study showed that areas with higher tree density had lower levels of antidepressant prescriptions. Research also shows that the more green space an urban area has, the more healthy social interactions between adults and children and the lowering of graffiti, property crime, and violent crime. Programs like Trees for Integration help reintegrate street children with their local community and encourage them to play alongside other local school children. Studies show that children learn faster and ADHD symptoms appear less when children have access to nature. Increasing the number of trees in a neighborhood helps develop a community’s economy by attracting more business and tourism and by improving the productivity of workers through better concentration and less mental fatigue. Trees also develop a sense of communal ownership (and appreciation) of common spaces. 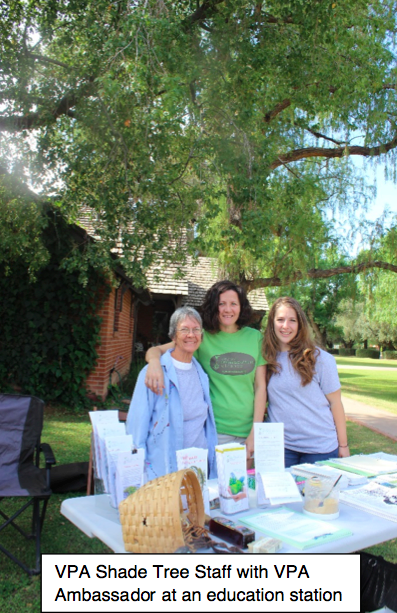 One study conducted by Furman University revealed that neighborhoods which didn’t regularly interact through block parties or crime watches did, however, start organizing other community events together once they started caring for their local communal trees. Through the VPA’s Shade Tree Program we’ve been able to meet people from across Maricopa country and participate in community programs like tree planting with local schools and the 10th anniversary of urban forestry at Super Bowl where members of the community rallied around the simple act of planting a tree. 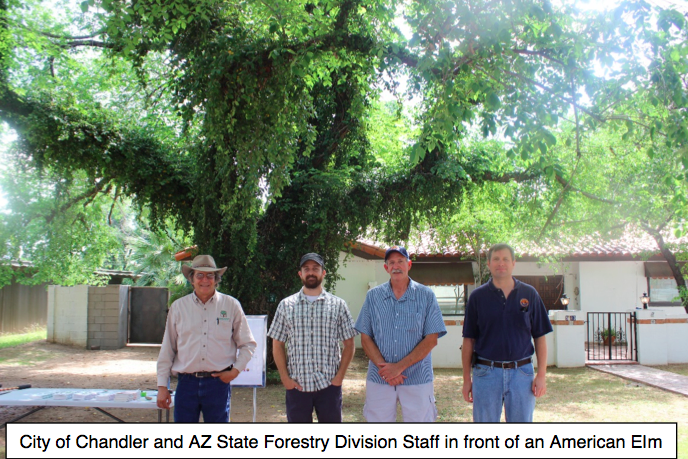 Trees can serve as landmarks in communities, such as the 2014 Magnificent 7 Trees that were recognized this past week at the Arizona’s Capitol Arbor Day celebration. Over the past several months we have looked at the many benefits trees provide--from energy savings to air pollution reduction to water conservation. 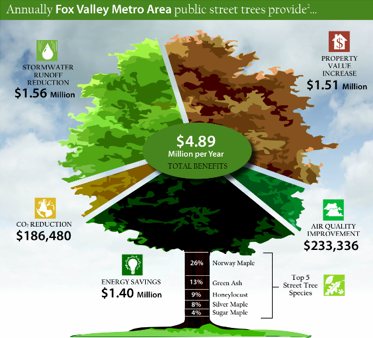 Tools like i-tree help us estimate in economic terms the benefits that trees bring to a community, such as the estimate below performed by a Wisconsin community. Perhaps, though, the one benefit that can’t be simply measured in monetary terms is the way trees tie us to our backyards, our neighborhood, and our overall community. As we near 100 degrees this week and park our car or wait for the bus or meet a friend under the shade of a tree, we can reflect on why trees matter. As we approach the end of our Why Trees Matter series, we’ll focus on a benefit that is often a question of Shade Tree Program participants—how do trees enhance property value? According to an online posting by the Arbor Day Foundation (ADF), a mature tree can hold an appraised value of anywhere from $1,000-$10,000. One study cited by ADF showed that 83% of realtors believe that mature trees have "a strong or moderate impact" on the salability of houses listed for under $150,000 and for homes listed over $250,000, 98% of realtors agree with that statement. Strategic landscaping, particularly with trees, can increase property values as much as 20 percent. 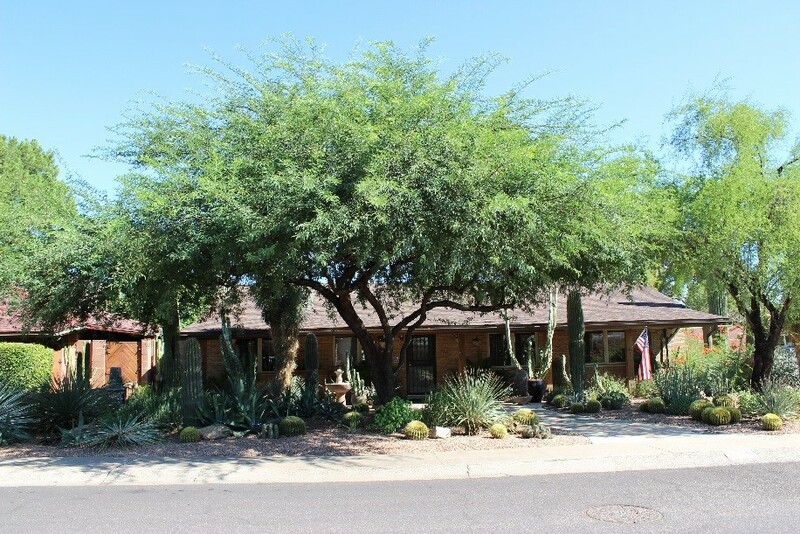 Pictured right is a local Phoenix home that is a great example of strategic landscaping. 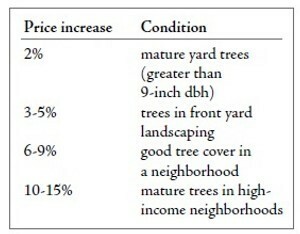 Below are various property price increase estimates from an article published in Arborist News. Depending on the location, size, and number of trees, property prices can potentially increase by 15%. The article also cited that homes near naturalistic parks are usually worth 8 to 20 percent more than comparable properties. Understanding the real estate benefits of trees is becoming increasingly important, and the Sacramento Tree Foundation has dubbed the benefits analysis as “Treelestate.” Trees can be so economically valuable that some homeowners insure their trees because the loss of a landmark tree during a storm, for instance, can depreciate the property value anywhere from 10-20 percent. Although it can take years of growth and care for a tree to reach a size that adds substantial economic value to a property, it’s worth the investment. Next week we will conclude our series by talking about, perhaps, the most important benefit that trees provide—a place for community to happen. For this week’s Why Trees Matter topic we will look at the wildlife habitat protection that trees provide and how this affects ecosystems. If climate change--particularly the earth’s warming--and deforestation trends continue, nearly one million species will become endangered in the next 50 years. Forests shelter over two-thirds of Earth’s land-based animals, including the largest portion of threatened species. Wildlife relies on trees for survival. Forests supply food, housing, migration and breeding resting spots, and a safe and natural habitat for wildlife. The symbiotic relationship between wildlife and forests plays a crucial role in ecosystems. For example, bees work as pollinators, birds become seed dispersers, and bears are food-chain regulators while their waste serves as natural forest fertilizer. Forest wildlife is nature’s ecosystem engineers and maintenance workers. Trees, themselves, are also important ecosystem regulators. 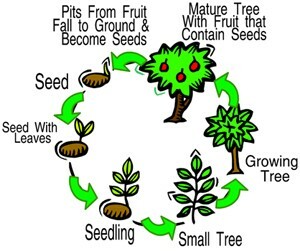 As part of the tree life-cycle (refer to the right diagram), a mature tree provide fruits, nuts, and seeds for wildlife and a percentage of tree seeds will grow to form new trees. In a properly functioning ecosystem, dead and decaying trees serve as nests, nurseries, and housing for animals and preserve moisture and nutrients that help with new plant growth and soil organisms. Trees heavily regulate the type and amount of wildlife in an area. By providing a livable environment for a species, trees largely determine their survival. Restoring forests is an important step in maintaining wildlife. Projects like Forests for Fifty is an example of an organization aimed at planting trees in all 50 states to restore damaged forests ecosystem and to support urban forests (the trees and other natural resources within an urban area). Planting and caring for trees not only protects wildlife habitat, but it also reduces the possibility of having to say goodbye to a million unique species of our forest community. In our last Why Trees Matter post we talked about how trees help conserve soil. This week we’ll talk about the other type of conservation trees perform—water conservation. If anyone else followed PBS’s Earth A New Wild series like us, hopefully you watched their final episode on “Water” which discussed the importance of preserving the limited resource. Not only do trees play an important role in water conservation, but they also help retain something we experience during our monsoons—stormwater runoff. Trees help preserve and manage water in several ways. First, their leaves and bark intercept and store an amazing amount of water. Although the quantity varies with tree type and size, one tree can store 100 gallons or more of water after 1-2 inches of rainfall. Part of this intercepted water will slowly be released to the soil below, requiring less additional water needed for trees and crops, and part will evaporate into the air. Tree roots also store water which will eventually be released into the atmosphere through transpiration. Transpiration is the process by which stored water in tree roots travel to the leaves and then evaporate into the air through stomata, or leaf pores. An average tree can release 250-400 gallons of water in one day. 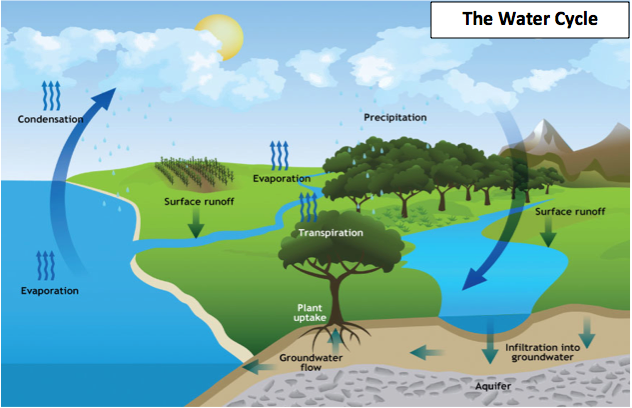 Through water evaporation and transpiration, trees play a critical role in the water cycle (refer to the diagram below). Much of the water that travels inland does not come from oceans, which also release moisture into the air that forms rainclouds. Oceanic moisture accounts for rain that reaches only 150 miles from the coast. Through tree evaporation and transpiration, air is remoistened as it travels farther inland from oceans and this accounts for much of the rainfall away from coastal areas. Trees and other small vegetation return nearly 70% of rain back into the air which then maintains the water, or rain, cycle and recharges rivers and lakes. Without trees the interior parts of continents would become deserts, such as in Australia and Africa were deforestation has led to minimal rainfall. 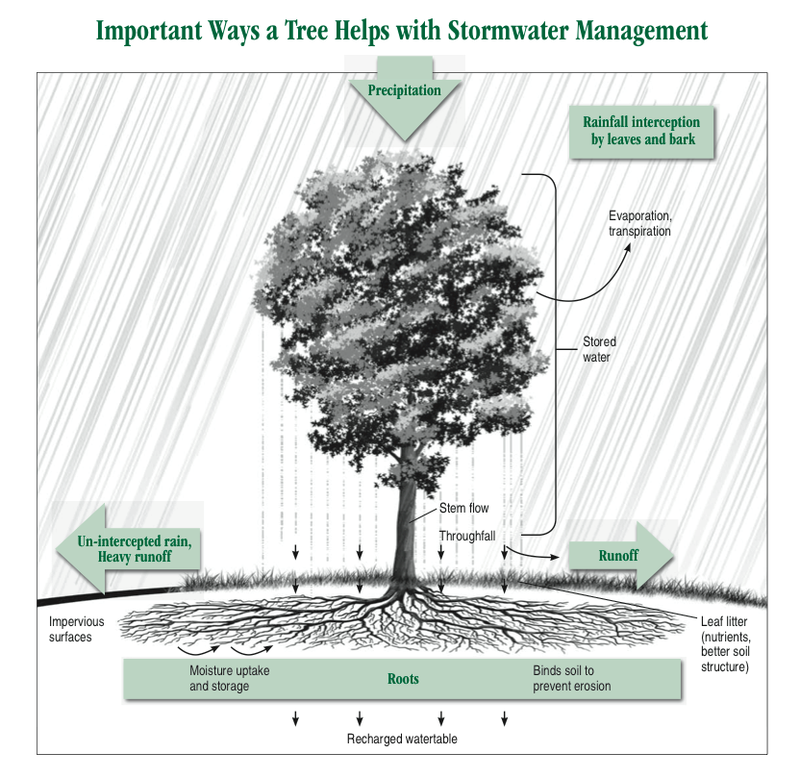 In an opposite but related vein, trees help redistribute and clean water by retaining stormwater runoff (refer to the diagram below). Trees prevent flooding from storms by trapping water in their leaves, trunks, and roots. One mature tree can potentially intercept 1,000 gallons of water a year. Some studies estimate that urban forests can reduce annual runoff by 2-7 percent and with strategic tree landscaping, nearly 65% of storm runoff can be reduced in residential areas. Additionally, trees improve water quality by trapping water that would normally run-off into waterways, carrying with it soil that contains sediments and nutrients. While nutrient-carrying soil may sound beneficial, excessive nutrients like nitrogen or phosphorus can lead to an overgrowth of aquatic plants that reduce oxygen content and disrupt fish life. Finally, trees help collect and filter water for local aquifers and watersheds that replenish the groundwater needed to supply drinking water for much of the world’s population. Trees play an amazing role in helping conserve and clean the world’s water supply. While the Shade Tree Program stresses the energy savings that trees provide, it’s important to understand the other crucial benefits that trees provide and why trees matter. For this week’s Why Trees Matter topic, we look at the important role trees play in soil conservation. Soil conservation deals with methods or processes used to prevent soil erosion and maintain soil health and productivity. Trees help conserve soil by reducing soil erosion, increasing soil organic matter, enhancing soil structure, and aiding in nutrient cycling. As a third of the world’s land surface is threaten by desertification, planting and caring for trees to help retain fertile soil is crucial not only to the health of the land but to over 850 million people who rely on agriculture as their livelihood. The most fertile part of soil is found in its first couple centimeters, or topsoil. It is vital that topsoil is maintained and prevented from being washed away as it is necessary for crop and pasture growth. The more topsoil removed, the more fertilizer will be needed and the quicker desertification occurs. Trees help conserve soil by holding it in place with tree roots (pictured below) and by creating a rougher soil surface with tree stumps, fallen branches, and foliage litter. A rougher surface area slows the rate of water flow that erodes soil and a rougher surface improves water infiltration into the soil which increases soil fertility and decreases the need to provide additional watering, something important as water becomes scarcer. Moist soil also prevents it from being eroded by wind. Another way trees conserve soil is by creating soil organic matter from their leaf litter and decaying roots. 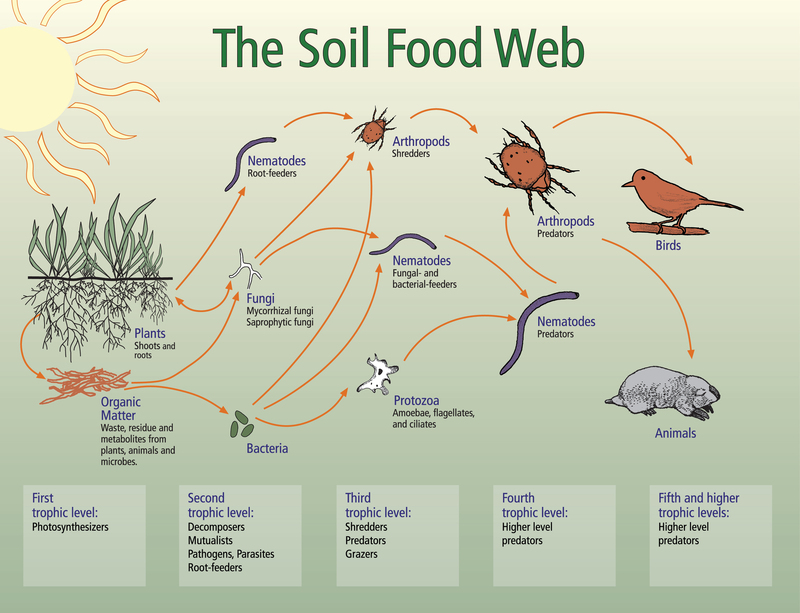 Trees and plants perform the first trophic, or nutritional, level of organic matter needed in the soil food web (refer to the diagram below). Soil organic matter increases the activity of microorganisms found in the soil which help increase soil fertility. 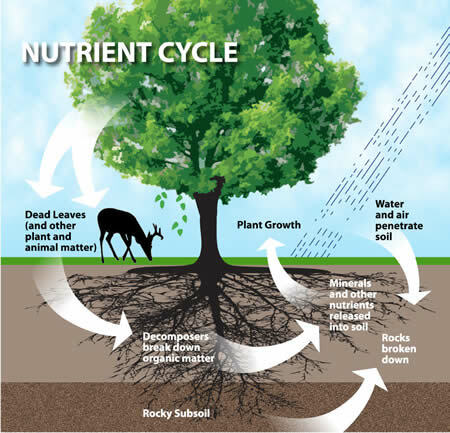 As organisms decompose various organic matter or consume other organisms, nutrients are converted from one form to another and made available to plants and other soil organisms. All plants depend on the food web for their nutrition and soil plays a vital role in the process. Trees also strengthen soil structure by providing biopores—pores left behind from decayed roots. These openings help water and nutrients travel through compacted soils to crops. While benefits from biospores may not be seen for several years, their effects remain important as crops in compacted soils can use biopore pathways left by trees many years after that area has been cleared of trees. Lastly, trees conserve soil by aiding in nutrient cycling. Trees recycle nutrients by moving them from underground to the soil surface, where they decompose to form soil organic matter. Tree litter such as leaves then decompose on the ground, releasing nutrients back to the soil for the tree to take back up (refer to the diagram below). Thick tree canopies are great sources of free, natural fertilizer not only by shedding leaves but also by capturing nutrients on leaf surfaces which are then washed from the leaves to the soil by rain. So far through our Why Trees Matter series we have shown the range of benefits that trees provide which we often take for granted or don’t even realize. These benefits include energy savings, carbon sequestration, air pollution reduction, and soil conservation. 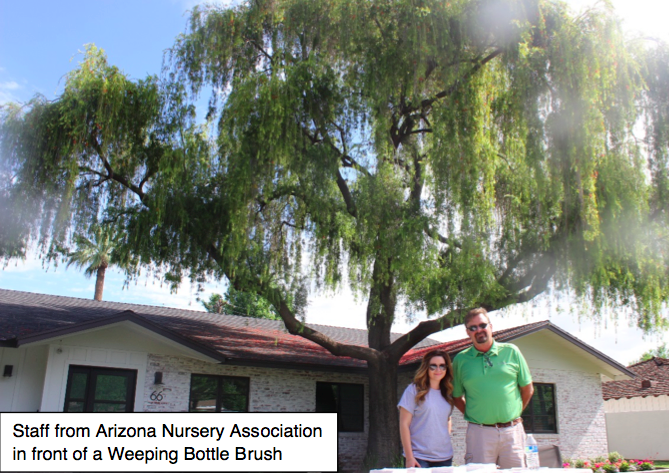 Next week we will introduce another tree benefit which is very relevant to our Arizona desert landscape—water conservation. This week in our Why Trees Matter series we discuss another crucial benefit that trees provide: air pollution reduction. One aptly worded description for the role that trees play is that trees are the earth’s lungs. 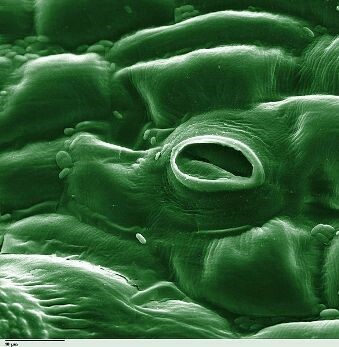 Trees filter the air of contaminates (such as nitrogen oxides, ammonia, sulfur dioxide, and ozone) by ingesting gaseous air pollution through tiny leaf openings called stomata (pictured right). Trees breathe in pollutants and then breathe out oxygen. One mature tree provides a day’s worth of oxygen for 4 people. 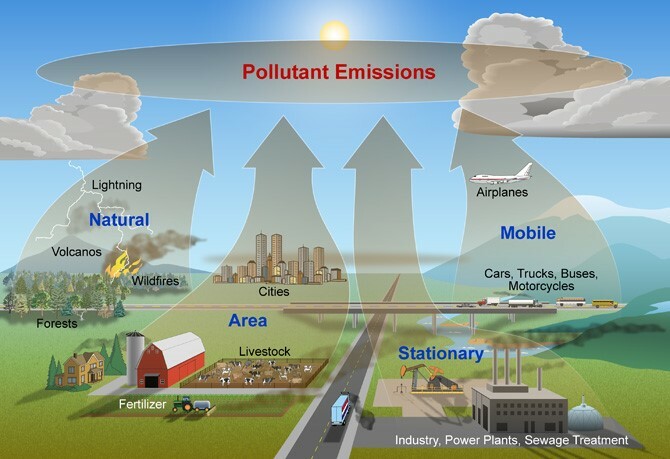 The main sources of air pollution come from transportation (mobile), industry (stationary), agriculture (area), and nature (natural). Refer to the picture below. In 2014, US Forest Service scientists and fellow researchers published a report detailing the largest study of air pollution removal by trees. The report concluded that trees save over 850 human lives a year and prevent 670,000 cases of acute respiratory symptoms--statistics based on air quality improvement of a mere 1 percent. In 2005, approximately 134,700 deaths in the US were attributed to air pollution. In a related study published in the journal Environmental Pollution, researchers estimated the value of human health benefits from air pollution reduction by trees to be almost $7 billion a year. The report noted that although most of the air pollution reduction occurred in rural areas (which have a higher concentration of trees), most of the health benefits were experienced in urban areas. One of the researchers concluded that because over 80 percent of Americans live in urban areas, the study reveals the crucial role that urban forestry plays in public health. Trees emit gases themselves, called biogenic volatile organic compounds (BVOCs). Urban planners, however, can select low-emitting BVOCs trees since different species emit different amounts. Additionally, the amount of BVOCs is dependent on temperature—less emission occurs at lower temperatures—and since trees tend to lower temperatures, increasing tree coverage can reduce BVOCs. So far we have seen how planting trees, particularly in highly populated urban areas, saves energy, reduces carbon in the atmosphere, and improves air quality. Next week we will continue learning why trees matter. 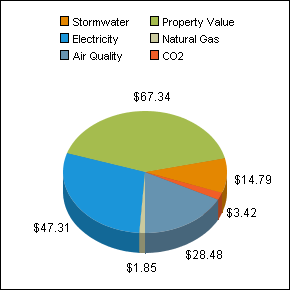 Last week in our Why Trees Matter series we focused on the energy savings benefits of trees. This week we will focus on a crucial ecological benefit—carbon sequestration. 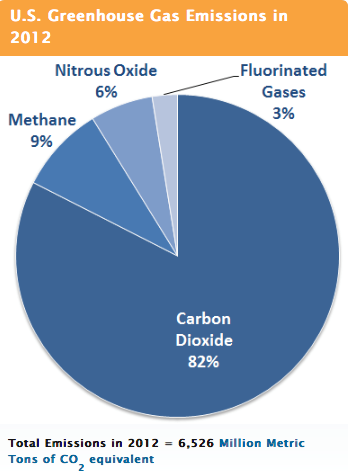 Carbon dioxide comprises 82% of greenhouse gases emitted in the US according to a 2012 report by the US Environmental Protection Agency. Trees are able to remove carbon dioxide from the atmosphere and store it (sequestration) in their roots, trunk, leaves, and undisturbed surrounding soil. As trees grow, they increasingly absorb more carbon dioxide from the atmosphere. Because trees store more than they release, forests are referred to as carbon “sinks.” Forests store more carbon compared to other land-based ecosystems. One tree can absorb nearly 48 pounds of carbon dioxide a year and sequester 1 ton of carbon dioxide in 40 years. One acre of grown trees is able to capture the amount of carbon dioxide released when one car drives 26,000 miles (that’s over 6 round trips by car from Arizona to New York). T rees use carbon dioxide as part of their food cycle. Through photosynthesis, carbon dioxide is converted into sugar, cellulose, and other carbohydrates needed to feed the tree. The rate at which a tree is able to store carbon depends largely on the tree type, age, and size. Younger, larger, and faster growing trees, on average, absorb more carbon. Nearly half of the dried wood weight of a grown tree is carbon. Forests are great resources for carbon sequestration and a natural way to slow and even reverse the trapping of heat in the Earth’s atmosphere. As we debate the best ways to favorably alter climate change, perhaps, one of the best ways is to plant trees. The greatest potential for adding the type of forest cover, and its benefits, afforded by trees is in urban areas. Urban forestry can play a large role in reducing greenhouse gases by reducing the energy used for air conditioning, particularly, in places like Arizona. 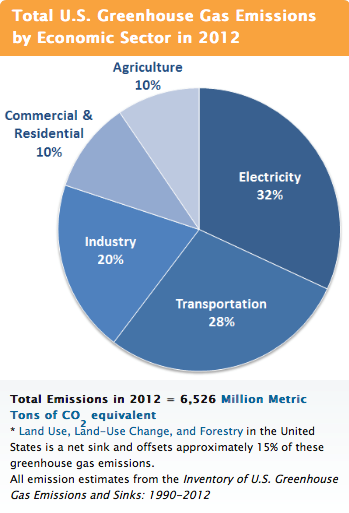 Electricity such as that used for air conditioners accounts for over 30% of carbon dioxide emission in the US. Planting more trees in urban areas not only reduces electricity usage by providing shade and other energy saving benefits, but trees also help sequester the carbon released from urban activities. Useful tools like this one help predict the amount of carbon dioxide sequestered in urban areas. Punch in your own information about the types of trees you have in your area and see the estimated benefits. 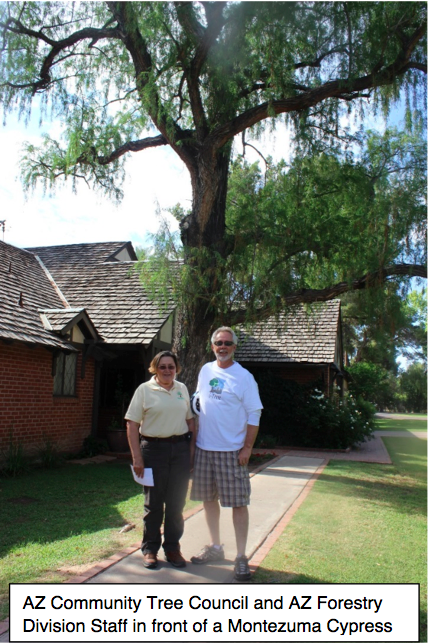 Below is an example of the annual benefits (in monetary value) of a mature Mesquite tree planted in downtown Phoenix. Notice the other estimated benefits afforded by trees such as improving air quality, stormwater runoff prevention, and enhancing property value. Next week we will go into one of these additional benefits that further explains why trees matter.